Product prices and availability are accurate as of 2019-04-04 22:02:51 EDT and are subject to change. Any price and availability information displayed on http://www.amazon.com/ at the time of purchase will apply to the purchase of this product.
? 3.Make sure that the resolution of your monitor meets the requirement.
? 4.The USB-C female port of this product is only for charging USB-C laptops whose USB-C port supports USB Power Delivery (PD).
? 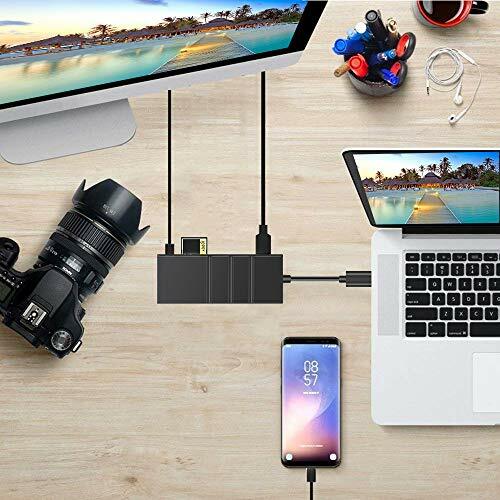 [Expanded Computer Add-On]: The 7-in-1 Type C Adapter features a gigabit ethernet port (RJ45 port), a type-c charging port, an HDMI video output port, a SD card slot, a TF card slot, and 2 USB 3.0 ports. All computer capabilities that integrated in one hub, connect and power everything. ? [4K HDMI Video Output]: Delivers high-definition audio and video. 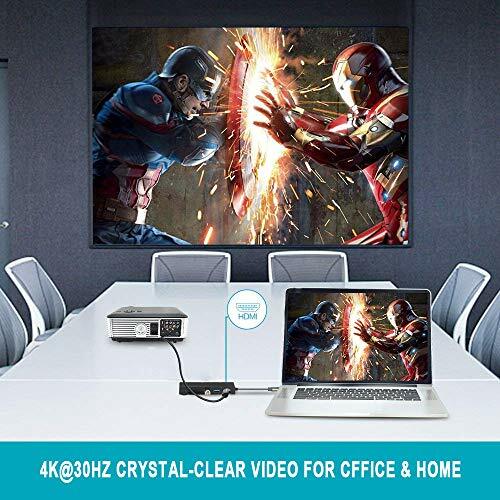 Supported resolution up to 4K*2K/30hz output, downward compatible with 720P, 480P. 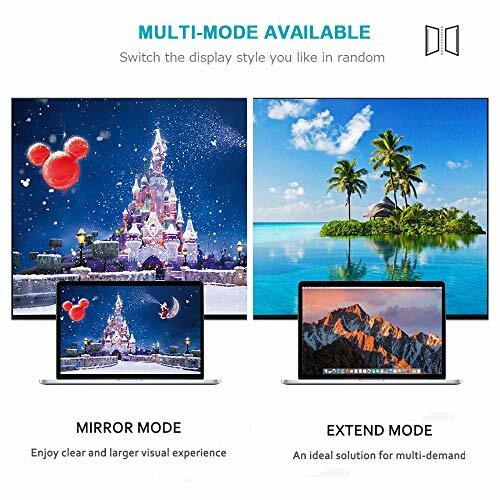 Please notice that only when your computer, display and HDMI cable are 4K-capable, 4K resolution can be achieved. ? [Gigabit Ethernet Port]: The Network Adapter offers full 10/100/1000 Mbps superfast gigabit ethernet performance over the RJ45 ethernet port, free access to max 1000Mbps network transmission, faster and more stable than most wireless connections. ? 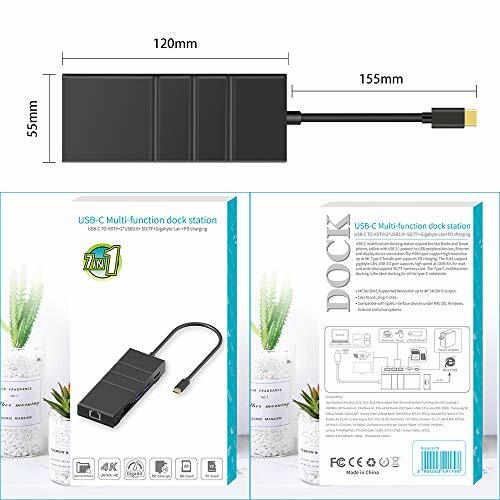 [Wide Compatibility]: Compatible with New MacBook/Pro 2015, 2016, 2017, Chromebook Pixel, Dell XPS12 XPS13 XPS15, Samsung S8, Galaxy Note8/S8+, Lumia 950/950XL, HP, Acer, Lenovo ThinkPad, Microsoft Surface Pro 4, more other USB Type-C devices. ? 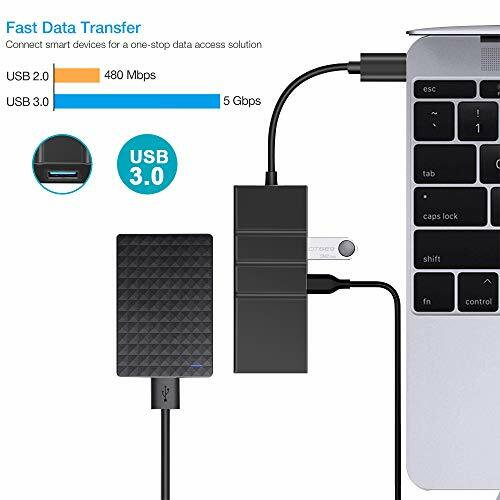 [USB-C Multifunctional Docking]: This type c multi-function docking station can extend the connection of a notebook to USB peripherals, the type-c charging port can be used for data transferring or PD charging, via USB 3.0 ports, you can connect to U disk, keyboard, mouse, etc.